I have a thing for Spinach and Ricotta. If not anything, I can just mix up the two and eat a whole meal with it. Its just one of those divine combos..made for each other type of food. Anytime I make Italian and need an appetizer or a little bite food, my brain and heart both leap forward and scream Spinach-Ricotta. And I listen like a good kid. No questions asked. This was one of those time when yet again, my brain and heart proved correct. And I was thankful I listened to them, no questions asked. The recipe is very simple. Frozen chopped Spinach+ Ricotta+spices filled in little pre made dough and baked as per directions. Simple right? Let's see them here step by step. Take about one pack of frozen chopped spinach. Add about 1 cup of ricotta cheese to the spinach and mix well. Add a few spices - black pepper, some oregano, basil and some parmesan cheese. Add a pinch of salt and mix well. And here's what I used for the dough. 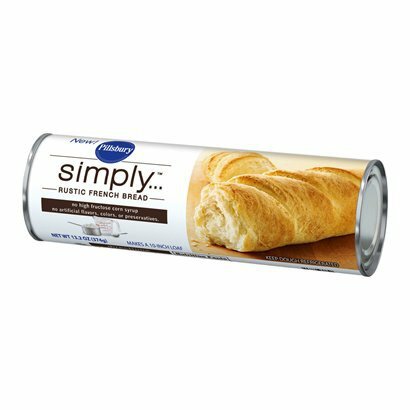 The pre made packaged french bread roll from Pillsbury. Photo courtesy of the Pillsbury site. Take the dough out and cut into small bits. Stuff about a spoonful of spinach mix in the dough and fold over on both sides. Make a little wrap and set on the seam side down on a foil lined baking sheet. It is ok if the spinach mix is spilling out like this. If you want complete rolls, just cut bigger sheets or use a pizza dough and roll into whole balls. You've then got yourself a spinach ricotta roll. Place all rolls with a little breathing space on a baking sheet and bake in a preheated oven at 350F for about 15 mins or until the rolls are well baked and golden. And you're done. Simple as that. Serve em up as wholesome wonderful biteable appetizers. This was a post thanksgiving italian dinner for my family. We had some bruschetta, ravioli and some fresh garden pasta. This is what families are made up of - crazy people and good food. God Bless them all! Wishing all of you a very Happy New 2012 ahead. Hope you have made your resolutions and sticking to them for a few days at least. Hope you all have a healthy and happy year ahead. Make this the year where you do something new or unique for a change. Take up a challenge, accomplish something, try something new. Do that thing that no one would expect you to do. And even if it might not work out, at least you would have tried. Enjoy the year ahead. This post is bringing you some comfort food along with it. There is comfort food and then there is this particular comfort food. Warm, sweet, ghee-laden comfort food. Now can it get any more comfortable? Nei-Appam - little sweetened rice balls cooked in ghee. Thank heavens they are small..and perfect to be eaten in bunches. Now who would not want comfort in bunches? This is a traditional south Indian sweet prepared for festivities especially during karthigai. And that's when I prepared it too but of course this post is coming to you late. There are a couple of different methods to make this delicacy. Some people add banana to this batter and then call them little unniappams - of course a specialty of Kerala. I prefer to do this however without the banana ..just because I'm not a fan of banana as many of you are aware. Let's get to the post. Soak 2 cups of rice in warm water for about 2-3 hours. Once the rice is soft, grind to a smooth batter and set aside. Melt about 1 1/4 cups of jaggery in a small pan with a few drops of water. Add the melted jaggery to the rice batter and mix well. Add a couple of pinches of cardamom powder to the batter and mix well. In a little kuzhi paniyaram pan, add a couple of drops of ghee in each cavity and heat up. Slowly pour spoonfuls of batter into each cavity and let it cook. Make sure the pan is in medium heat so that the appams cook inside and don't overcook on the outside. Flip over each appam using a skewer and let cook for a few minutes on the other side. And they are done. Easy as that. Comfortable to make and totally comforting to eat. Now that is what I call good food. We also made some peanut ladoos for karthigai and here they are. Say your prayers and dig into wholesome festival goodness. They just look awfully cute to me. Can you imagine working on wall street in New York and you step out for a snack and there is a little vandi kadai vendor selling these hot off the grill. Poor little hot dogs will need a run for their doggy money. Go ahead, grab some. And let me know if you liked them.